Ski Europe. Massive terrain, impressive lifts, great skiing. Courmayeur, Italy. Ski Europe for perfect powder. La Thuile, Italy. Ski Europe for wonderful villages. Saalbach, Austria. Ski Europe for awesome terrain. Engelberg, Switzerland. Ski Europe for the beautiful cities. Innsbruck, Austria. Ski Europe for the excellent children's ski programs. Mayrhofen, Austria. Ski Europe for the modern, efficient lifts. St Anton, Ski Arlberg, Austria. Ski Europe for apres like no other place on earth. Alta Badia, Dolomites, Italy. Ski Europe for vibrant ski village atmosphere. Saalbach, Austria. Ski Europe for solitude. Via Lattea, Italy. Ski Europe for quirky ski resorts. Sestriere, Italy. Ski Europe for uncrowded lifts & perfect piste. Arosa, Switzerland. Ski Europe for incredible fun-slopes and terrain parks. Val Gardena, Italy. Ski Europe for delicious alpine dining. Zillertal, Austria. Ski Europe for exceptional resort facilties. Stubai Glacier, Austria. Ski Europe for comfortable resort access by train. 3 Peaks Dolomites, Italy. Ski Europe to ride unbelievable lifts. Madonna di Campiglio, Italy. Ski Europe for year round glacier skiing. Hintertux Glacier, Austria. Ski Europe to ride some of the best mountains in the world. Monterosa, Italy. For a snow experience unlike any other in the world, every Powderhound must ski Europe. The huge terrain, incredible lift systems &awesome snow mix wonderfully with the mountain villages, history, traditions, cultural diversity plus the fabulous food & drink. Spending the night in an Italian mountain rifugio or an Austrian guesthouse dating from the 1500s add layers to European ski holidays that make it unforgettable. Once you ski Europe, you will definitely be back for more. The number of ski resorts in Europe is massive, easily exceeding 1000. From small village lifts to enormous interlinked resorts that have to be seen (& skied) to be believed. Much of Europe's best skiing is in The Alps, which span the Mediterranean coast of France through Switzerland, northern Italy, Austria, southern Germany and into Slovenia. The mountains are giants so skiing in Europe offers endless runs on huge vertical, and the spectacular scenery can be admired from the slopes, a comfy lounge chair or from soaring cable cars. The ability to ski from village to village is common, and in numerous resorts one can even ski from country to country. The old-world villages are quaint and offer opportunities to stop for a food, wine, beer or an aperitif. In southern Europe, the Pyrenees reign supreme, with numerous ski resorts and backcountry freeride options in France, Spain and the tiny principality of Andorra. Landlocked Andorra is surrounded by high peaks and has built its economy on tourism, mainly based on skiing and shopping (fully duty free! ), so you know it will be a great experience. Skiing in southern Spain allows for some beach and snow combinations that are difficult to replicate elsewhere in the world. For the more adventurous, Norway and Sweden have some wonderful ski and snowboard adventure opportunities. Iceland and Greenland even more so. In the snowy Caucasus of Russia & Georgia, there is some massive investment in improving current resorts and also creating several new ones. Skiing in Russia includes one of the highest ski lifts in Europe at Mt Elbrus. Georgia is amongst the cheapest places to ski in Europe and can include cat skiing. Speaking of cats, the oldest cat ski operation in Europe is in the relatively unknown ski destination of Macedonia. Luckily for the Powderhound, in many European ski resorts the locals have their priorities totally skewed when it comes to skiing. Many European's prioritise food & drink as the most important component of their ski day, then après ski festivities a close second, whilst the actual skiing or snowboarding is a distant third priority. This is what makes Europe a great ski holiday destination! There’s excellent skiing and snowboarding for the early riser, but also a chance to soak up some fabulous European culture, enjoy après and the animated nightlife, plus eat the wonderful cuisine. Back-country touring opportunities are boundless in Europe, but avalanche awareness and skills are absolutely necessary. If in doubt get a guide or join a tour. See all our hosted tours here. Heliskiing opportunities are increasing in Europe as well. The best operators in western Europe are based in Italy around the high Alps of the Aosta valley from Monte Rosa to Monte Bianco. Other great heli ski options are in the wilds of the Caucasus and Kamchatka in Russia. Travelling to Europe for a ski holiday is as simple as going anywhere else in the world. Perhaps even simpler than most continents by virtue of the superbly integrated transport network. Key airports to access ski resorts in the Alps are Geneva, Zurich, Munich, Innsbruck & Milan. Trains, buses, private transfers, taxis, car rentals & motorways then seamlessly link to the ski resorts. For example it is possible to land in Milan, take a train directly into the city, another directly into Switzerland at Brig & then step onto another which stops at an integrated station with a cable car to Aletsch Arena ski resort. No need to even touch a road! Awesome. Nothing like started a very long list with the one of the smallest nations in Europe. The mountainous principality of Andorra is wedged in the Pyrenees between France & Spain. As well as being a tax free haven, Andorra has three superb ski resorts. Each resort has elements that will appeal to all snow lovers. Ski Austria for the authentic village based resorts, amazing lift systems, wonderful off-piste powder, all year round glacier skiing, sensational après and the huge interlinked resorts. The Alps cover most of Austria, and almost every major (and minor!) town has some sort of ski lift infrastructure. Austria is where alpine skiing was born and perfected, and the Austria ski resorts offer a very traditional skiing experience which resorts in other countries try to emulate. Even though it is a relatively small country, Austria has the most ski resorts in Europe - 275 (ish! ), and we would argue, also the best ski resorts in the world. Ski France for its huge high altitude, interlinked ski resorts, great food and wine, but also for the dramatic scenery, high altitude, consistent snow-pack, wonderful off piste powder and long, wide runs. The French locals in the mountainous areas are incredibly friendly, which adds to the experience. 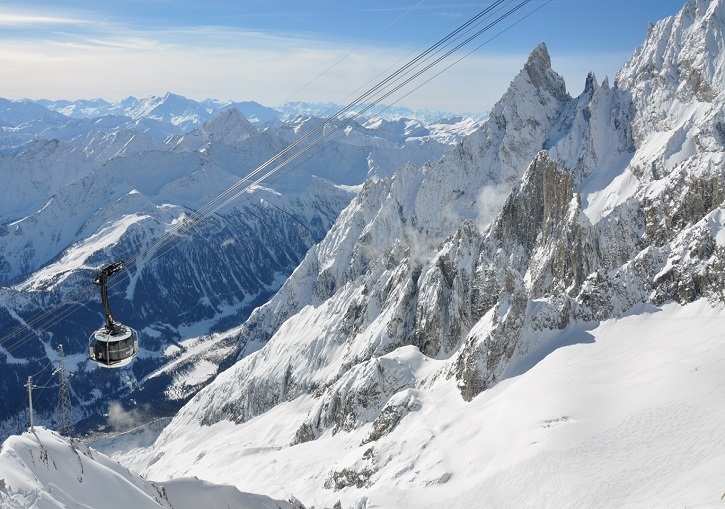 France also has some of the best extreme terrain in the world at Chamonix on western Europe’s highest peak, Mont Blanc. This French ski resort is on steroids and attracts hard-core skiers in particular, but has diverse terrain to provide a great experience for skiers and snowboarders of all abilities. Serre Chevalier is a world class ski resort with terrain for all abilities, plus wonderful off piste powder opportunities. Val d’Isere & Tignes are amongst the best ski resorts in Europe. They cater to a more 'well heeled' market & have plenty of wide runs for beginners & intermediates, but the terrain is well worth the journey into the Tarentaise for us 'great unwashed' as well for the exciting freeride opportunities. Nearby Sainte Foy is the worst kept powder stash secret in Europe, but like Les Arcs, should still be on any Powderhounds list. The world's largest lift & ticket interlinked ski area is in France - the 3 Vallees (it is actually 4 with Orelle added in!). Made up of three main resorts, Courchevel, Meribel & Val Thorens, it boasts enough lifts, trails and humans(!) to make your head spin. A huge range of 'smaller' resorts exist in France that will be attractive to the Powderhound seeking a bit more solitude. La Norma, Bonneval, Valfrejus & the newly created Sybelles are but a few. In southern France, the Pyrenees have several world class ski resorts (Ax, Saint Lary) & sensational backcountry terrain. In some years the Pyrenees score more snow than the Alps! Skiing in Italy is as much about the eating, long lunches aperitifs and wine consumption, as it is about exploring the slopes and skiing powder. The culture is super relaxed and friendly but the skiing is superb and exhilarating. All that food and drink means they get out of bed a bit later too - great first tracks in Italy! Italy also provides the best value for money in Europe. It would surprise many people to know that Italy has the second highest number of ski resorts in Europe - over 200! The Aosta valley has Italy's best skiing. Monte Cervino (the Matterhorn) is right on the Swiss-Italian border near Cervinia ski resort and Monte Bianco (Mont Blanc) straddles the French-Italian border near the wonderful Courmayeur and La Thuile ski resorts. Excellent resorts like Pila and Crevacol give the area diversity. The Monte Rosa massif offers a feast of skiing via the Monterosa Ski interlinked resort - a Powderhounds favorite. To the south, resorts such as Sestriere near the winter Olympics host city Turin (Torino) are fully linked with Oulx and other resorts to make up the excellent Via Lattea. Further east, Madonna di Campiglio is surrounded by numerous fun ski resorts & the stunning Brenta Dolomites. In the Dolomites, Cortina is a stylish resort with stunning scenery and world's best extreme terrain in the right conditions, plus Alta Badia, Arabba-Marmolada, Val Gardena and 3 Peaks all have their charms. The fabulous cities of Milan, Turin, Verona and Venice are also within a few hours of the resorts. Ski Switzerland for the high altitude powder, precise organisation and train networks, cosmopolitan flair, great lift systems, charming villages and dramatic scenery. The après is relatively restrained in Switzerland, but there’s still nightlife, and partaking in fondue is essential - but grossly over rated!! For Powderhounds, the larger ski resorts of Andermatt, Engelberg, Verbier, Laax and Arosa Lenzerheide are absolute stand outs. They all boast steep and deep off-piste skiing, but also great terrain for families. St Moritz is glamorous and fashionable but has perfect piste trails, great off piste and a dark side at Diavolezza for experts. Davos-Klosters is also refined and sophisticated but with fabulous terrain, whilst Zermatt ski resort is a sensational all-rounder with the towering Matterhorn overlooking the fascinating town. Aletsch Arena is perfect for a family ski holiday. A multitude of unknown Swiss ski resorts like Brigels, Belalp, and Lauchernalp have wonderful skiing and snowboarding without the hustle and bustle of the mega resorts. Georgia is undergoing a massive expansion in ski resorts & winter sports in general. The Greater & Lesser Caucasus mountains border Georgia. Snow pukes down due the influence of the nearby Back Sea. Gudauri is the major ski resort & number of new ski resorts have opened in recent years with others planned - bucking a global trend! Cat skiing is available too. Like Georgia, Russia has invested squillions into the ski industry, particularly for the Sochi Winter Olympics. Modern ski resorts like Rosa Khutor compete with (or compliment) places like Elbrus with its highest lift going to 3847m! For adventure, cat skiing in Siberia and heli skiing in Kamchatka will fulfil anyone's wishes. Skiing in Germany is possible at over 100 ski resorts. It is no real surprise however that the best ski resorts in Germany are generally in southern Bavaria where they cling to the Alps near the Austrian border. Some truly remarkable railways and cable car climb the spectacular 2962m high Zugspitze where skiing takes place until May on the glacier. Below the Zugspitze is Germany's best known ski resort, Garmisch Classic, which boasts a North America and Japan beating vertical of over 1300m. Skiing in Norway, Sweden, Iceland and Greenland is generally for the more adventurous (and sometimes cashed up) Powderhounds looking for something completely different. In Norway, whilst there a number of ski resorts to sample, experiences like ski touring Svalbard, lodge or boat based skiing from mountain summits down to the fjords in the Lyngen Alps & Mush and Ski adventures with sled dogs are once in a lifetime experiences & the real reason to visit. Similarly, for some of the back-country tours available in Iceland & Greenland. In Sweden several ski resorts like Riksgransen above the Arctic Circle are sensational & the chances of seeing the breathtaking aurora borealis is very high. More information on these locations is coming soon. Yep, skiing in Spain. Kind of like thinking about skiing in Australia (that's Australia not Austria), the first question is always an incredulous, '... is there skiing in Spain?'. Yes there is & some of it is mighty fine. The Spanish Pyrenees are gorgeous & include world class, snow laden resorts like Bacqueira Beret & La Molina Masella, plus some more sneaky stashes. There is even the opportunity to do some funky sunny beach, historic cities & powder snow combinations like down south at Sierra Nevada. More information about skiing in Spain is coming soon. Poland's mountainous southern rim provides prospects such as Zakopane in the Tatra Mountains. Slovakia, on the other side of the Tatras, is a relatively new adventure destination with lots of mountains & varied terrain to explore. Ski resorts include Jasná, Donovaly, Vratna & Drienica. Romania is becoming an attractive destination for skiers including resorts at Poiana Brasov and Sinaia. Slovenia is beautiful environmentally friendly mountain nation. The best known areas are the Kranjska Gora & Maribor Pohorje. Both host downhill events. Bulgaria’s resorts include Borovets, Pamporovo & Bansko. Hang on to your wallet! Skiing in Europe can be as economical or expensive as you wish. The cost of lift tickets is extremely cheap when compared to all other continents with the exception of Japan. Eating and drinking out is comparative to other places in the world. The usual rule is if you want to save money, eat in! Italy & Spain are the exceptions, where eating out is cheap no matter where you are. Of the big 4 ski destination countries in Europe, by far the cheapest skiing is in Italy, followed by Austria & then France & Switzerland. Switzerland is the most expensive ski destination in Europe. By way of cost comparison to North America for lift tickets, in 2017 a day lift pass at Keystone in Colorado costs about US$136 (or about €128) whereas a day lift pass for the Italian part of the massive Via Lattea cost only €37 (or about US$39). The mathematics is stark. Move further east and the prices drop even more. The modern Russian ski resorts have daily lift tickets for around €20 -25. Slope side accommodation in ski resorts (as with anywhere in the world) will tend to hit the hip pocket, particularly in France & Switzerland, although of course there are different standards available (from budget to extravagant) at any given resort. In Europe the options for staying in excellent 'off mountain' village accommodation are vast, can be considerable cheaper & far more rewarding from a cultural experience point of view. Accommodation standards vary from country to country. For example, a 2 star hotel or guesthouse in Italy & Austria is as good as, or better, than most 3 star accommodation in France. Skiing in Europe is so different to the rest of the world. The ski resorts are the best because it is not just about cutting laps on a bit of hill. Skiing here is a journey from mountain to mountain, valley to valley & village to village. Unlike being stuck in an isolated ski resort village somewhere in a nation's hinterland, skiing in Europe can provide something new every day - if you want it too! Learning a new language is another reason to go & ski Europe. In western Europe, coping with local languages isn’t too difficult & is another reason to ski here. Even though you may not realise it, you’ll probably already know a few words of French, Italian & German. Regardless there are so many British tourists frequenting the ski resorts that a degree of English is spoken in all places. It is good fun trying the local language & adds an intellectual element to any European ski holiday. Eastern Europe isn’t quite so populated with English tourists, but in order to get away from the crowds, the small vocabulary you’ll need to learn will be worth it. Learning some European language will be part of the cultural enjoyment of the skiing holiday. If you haven't skied Europe yet, do it now. Airfares & lift passes have never been cheaper and you will be richer for the experience. Price p/p From price based on minimum 3 person in group. Base/invoice currency is in Euro ex taxes. Price p/p From price based on tranfers, 7 nights 4 share room, full board & 5-6 days guided cat skiing.